JACKSONVILLE – Wide Receiver Durron Neal (5’11,191) signed with the Jacksonville Sharks for his third season of arena football. Last season, Neal played in 14 games with the Columbus Lions, where he led the Lions in receiving yards (1085) and average yard per catch (13.7) and earned Second Team All-NAL honors. Neal also finished the season ranking second in catches (79) and touchdowns (25). 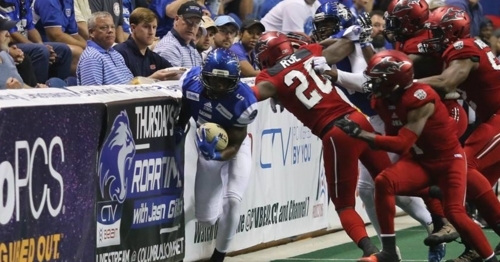 In 2017, Neal began his arena football career with the Lions, playing in nine games. In those nine games, he had 37 receptions for 309 yards and seven touchdowns. Neal was an undrafted free agent entering the 2016 season when he signed with the Denver Broncos for training camp. Neal played for the Broncos the pre-season, recording three catches for 21 yards and one touchdown but was not with the team for the regular season. Neal attended Oklahoma University and played all four years as a Sooner. In his four years, he racked up a total of 104 receptions for 1,323 yards and six touchdowns. He also rushed twice for 19 yards. As a kick returner, Neal returned nine kickoffs for 122 yards. Neal is a native of St. Louis, MO and attended De Smet Jesuit High School.